Americans have been feeling pretty generous. In 2016, various people and organizations supplied an estimated $390 billion to U.S. charities, with a four percent increase in giving from individual contributors alone. The data isn’t in for 2017 quite yet, although one recent survey of 2000 donors revealed that 45 percent planned to give even more this year. You don’t need to be a wealthy philanthropist to feel the giving spirit, especially during the holiday season. This winter, consider donating one or more of the items below to a needy nonprofit or charity. When the temperature dips, the demand for warm clothing rises. Plenty of charitable organizations solicit used garments and shoes for the needy, but make sure to exercise judgment while cleaning out your closet. Since everyone deserves to look fashionable and put-together, limit your donation pile to clean and gently worn outfits. Good options include that sweater you recently scored on sale that’s slightly too tight, or the spare coat you’ve never worn that still has the tags on. One in six people in America face hunger, according to one national estimate, and many depend on food banks, pantries, and soup kitchens for regular meals. Turkey and ham are expensive and require refrigeration, but some lower-cost seasonal feast items like canned pumpkin, yams, and cranberry sauce make easy and festive donations. It’s worth pointing out, however, that not everyone likes to eat cranberries or stuffing during the holiday season (especially if they don’t observe traditional dates like Christmas). 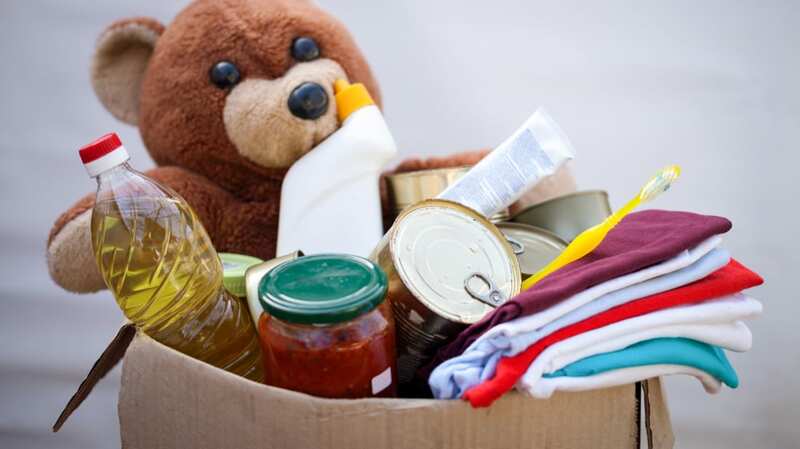 Typically, charities are always in need of healthy staples like canned tuna and meats, sugar-free fruit mixes, beans, rice, oatmeal, and peanut butter. Just make sure that everything is commercially packaged, labeled, and sealed, and that the cans aren’t rusty or dented. Writing a check probably doesn’t feel as gratifying as hauling boxes of goods to a soup kitchen or shelter. But some charities depend on annual cash donations to stay afloat, especially during tough economic times. Plus, when you opt for straight-up currency, nonprofits can use it to purchase the exact items they need (which are sometimes the least-obvious, like sponges or pet food). Low on cash, and want to let your crafty side loose? Give the gift of coziness, and look for charities and nonprofits in need of handmade knitted items. Love cats or dogs? Try making security blankets for shelter animals. Other options include—but aren’t limited to—creating warm blankets for the homeless, or for troops abroad; crafting tiny clothing items for newborn or premature babies; stitching snug head covers for hospital patients undergoing chemotherapy; and knitting teddy bears for sick kids in developing nations. Keeping clean can come at a cost, as personal hygiene products like toilet paper, shampoo, laundry soap, diapers, and toothpaste tend to go quickly and often aren’t covered by government assistance programs. Check with organizations and charities to see if they need bathroom and laundry basics, but make sure that all contributed items still have an intact seal, or are encased in their original packaging. Travel or sample size products are often in demand, as they’re convenient to use in public rest areas. The holidays can be hard for homeless kids, or for families that don’t have the means or circumstances to provide children with gifts. Large charitable organizations and local groups alike (think schools, churches, hospitals, and shelters) often hold used and new toy drives, or provide donors with wish lists to ensure that everyone has something to unwrap in December. In the case of toy drives, make sure that all new items are still in their original packaging. Used toys should be clean, safe, and in good condition, and might need to be prepped according to specific guidelines. And before cleaning out your kid’s playroom or nursery, keep in mind that some charities don’t accept certain goods, like baby items, while places like hospitals might not accept used toys at all. It’s expensive to take care of a furry, feathered, or scaled friend, even if their love is priceless. Community pet pantries keep animals out of shelters by providing their hard-up owners with free or low-cost toys, leashes, litter, and food. You should always double-check with a pet pantry before making an unsolicited donation, but many accept unopened pet food, cat litter, and new (or nearly-new) leashes, toys, and collars, along with onetime or recurring financial donations.